After 3 Thanksgivings spent in Italy (celebrating my fourth this week!) I’ve become more accustomed to the ups and downs of celebrating this holiday away from home, and usually surrounded by Italians. My favorite part of the long, drawn-out lunch we do every year is watching the reactions of my Italian friends to sweet potato dishes and the combination of cranberry sauce and turkey. Italians are almost always floored by the American tendency to mix sweet and salty flavors during the main course and have asked me if sweet potato casserole is actually a dessert, or why a vegetable like pumpkin would ever go into cakes or pies. 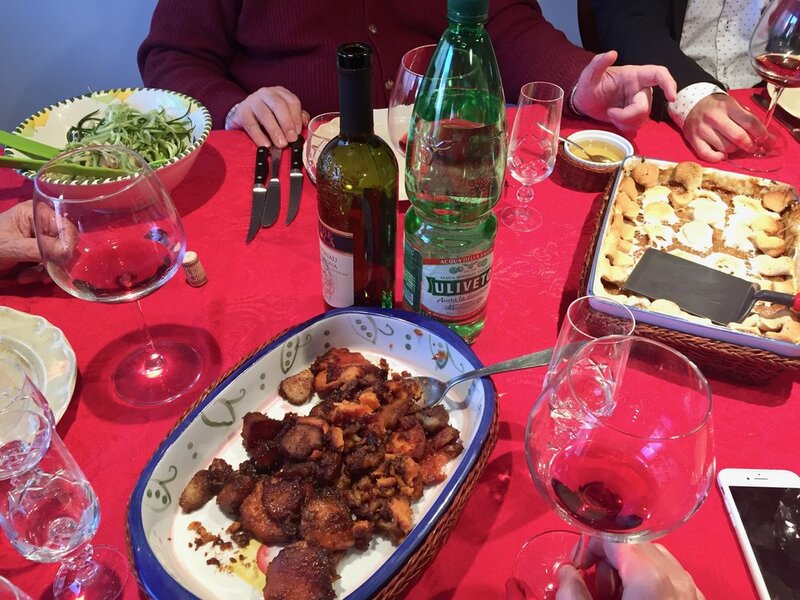 I’m so lucky to have Edoardo’s mother, Franca, who makes most of the meal and a particularly delicious turkey that is traditionally a Christmas dish in her house. After some trial and error, we’ve come up with good compromises for an Italian-American stuffing including bread, sausage, sage, and mixed veggies that’s always phenomenal, her amazing potato puree that is even creamier than traditional mashed potatoes and a variety of vegetable sides. I’ve taken on the job of preparing the sweet potato dish that my family eats for every Thanksgiving and Christmas, candied sweet potatoes, caramelized with unreal amounts of butter and brown sugar and what I consider a sub-par apple pie. I’ve never got the homemade crust just right but it gets a tiny bit easier every year that I practice. I tried a pumpkin cake with cream cheese frosting one year and after being the only one at a table of 12 to like it, eventually gave up on pumpkin desserts. When prepping for our non-traditional feast, we make sure to order a turkey from the butcher at least a week in advance (they don’t usually carry such large birds in Rome this time of year) and head to Castroni to pick up staples like cranberry sauce, brown sugar and canned pumpkin. The rest I can usually find at our local supermarket. While the holidays always make me a bit homesick and nostalgic for home and my family, I love that I have such a supportive family on Edoardo’s side and friends who help me celebrate and eat all of my favorite dishes. If you have any tips for celebrating your traditional holidays while abroad, please leave them below. It does get easier with time, but I think the most important element to Thanksgiving (or any holiday really!) is having your friends and loved ones around a table with you, no matter what you’re eating.